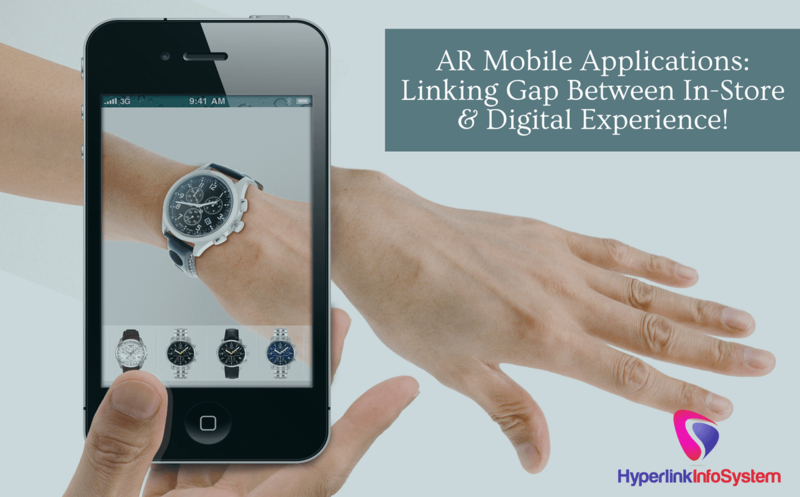 AR Mobile Applications: Linking Gap Between In-Store and Digital Experience! Augmented Reality Mobile Application – A change which is futuristic is now highly adopted in the current market trend and is not too far to be run-of-the-mill for mobile Industry. Creating a virtual experience in the real world is what augmented reality aims at. This aspect can be used by Indian app developers to develop an AR based mobile apps to serve mankind with some new and exciting experience. App development company can make use of AR technology to improvise their project and product that they serve to their customers. With the current market trends, the emerging AR/VR technology is highly adopted by people and is one of the most challenging ones to implement in the mobile application that serves the addresses of the masses of people. It wouldn't be surprising if such technology would hit the bounds of $120 billion by the end of 2020. Engaged by such fact? Then now, it's time to get in-depth about such money-making technology like, how to develop AR/VR-based mobile applications on platforms like Android, iOS, and Windows? How feasible is it for the business enterprise? How will it be helpful to make it operative for business benefits? Where does Augmented Reality is headed now? Marker based concept is all about having a software that recognizes the pattern or symbol whenever a camera scans it and projecting a digital content on the surface of the symbol. This approach is basically used for navigational purposes where a user's current location is recorded and after recording current user's location on their smartphone device, they are given the information regarding the surrounding places and direction to intact with those places. Why should one Experience Augmented Reality? Augmented Reality fixes the huge gap between real and computer generated experiences by keeping digital information like that of images and videos in user's real scenario. It helps to learn the things that were thought to be some illusion. How augmented reality takes on device fragmentation? AR technology is not totally reserved for wearable devices like Google Glass, Smart TV, Go gears or for that stuff that is not part of everyone's daily routine rather it can be pushed up to implement in mobile and smartphone devices like tablets, iPads, wearables with the help of platforms like Android, Windows and iOS. When we think of Augmented Reality based mobile application services, it can play some crucial role in application sectors like education, enterprise, consumer apps, mobile and gaming application, advertisement apps and so on. Why should business count on to develop AR based mobile applications? Yes, you are making it true! Augmented reality is going to be a next big turning step in the modern business approaches to spice up the consumer expectation and to stay up front with the competitors – especially in retail commerce. On the contrary side, investment is not that high as AR is quite commercials friendly. 1) Branding: Development of AR based applications will let your brand gets recognized in a spark and most importantly, creates an impact in a way that it attract your targeted audience mind. 2) User Experience: Augmented reality complements shopping experience with the bit of visual content and sound. Customers will find themselves in the most familiar surrounding while experiencing something convincing and engaging. 1) In-store Experience: Impersonifications of products of real size in virtual trial rooms that fits the dress on customer body making the in-store shopping experience more feasible in absence of products. 2) Online Shopping: Video demo that leverages more information along with the videos of unwrapped products that give store like the visit to customers or shoppers. 3) AR Maps: Augmented Reality apps when blended with maps can navigate and give nearby places details when enticed with technologies like geolocation. 4) Travel: Digital walkover of sites, ambiance and ancient information along with the panorama view of the entire site. 5) Education: AR based application can lead to more engaging classrooms and interactive sessions in an educational sector. How to build Augmented Reality Android apps? AR Android apps can be developed using the Android SDK as it leverages the API for communicating with the camera. To make use of 3D graphics, Android SDK provides OpenGL support making it easy for developers to code. To develop AR apps on iOS, one can make use of Craft SDK. It's API gives you immense support to edit existing Augmented Reality Content while pushing up the newer ones. One can upload 3D models, videos and other media library on the cloud. Apart from iOS and Android, Metaio – which is an under development SDK and other several toolkits are available for creating AR application on mobile and other devices. Why choose Hyperlink Infosystem as a development partner? Here are the factors that stand out Hyperlink Infosystem as best player in field of AR development. 1) Customization: AR is evolving and so Hyperlink Infosystem develops AR applications that can be completely tailored and they do make sure that the possibilities for improvisations are infinite. 2) Security: Hyperlink Infosystem ensures that your Augmented Reality application is protected with multiple layers of security and make sure that your data is prevented from being hacked. Augmented Reality is the biggest next step to bring evolution in application development. If you are thinking to be the next big fame to bring change in the application revolution then contact our project manager. Let's brainstorm and make some innovative apps together!